While heart disease continues to be the number one cause of death for both men and women in the United States, advances in surgical treatments, which include an increasing array of innovative, minimally invasive procedures, are already making a difference in the length and quality of life for thousands of patients each year. In fact, Portneuf has your heart covered. We offer some of the most advanced and innovative surgical options for patients with life-threatening heart conditions and diseases. In a number of cases, we can eliminate incisions on the chest and can now perform open heart surgery with a closed chest. This has made an enormous difference, not only in replacing valves, but also in the procedure’s impact on quality of life. We have gone from 6-8 weeks of recuperation with a 5-day hospitalization, down to a 1 day stay in the hospital and back to full capacity in less than a week. On Tuesday, April 16, 2019, I will host seminar, Heart Disease: the Silent Killer. 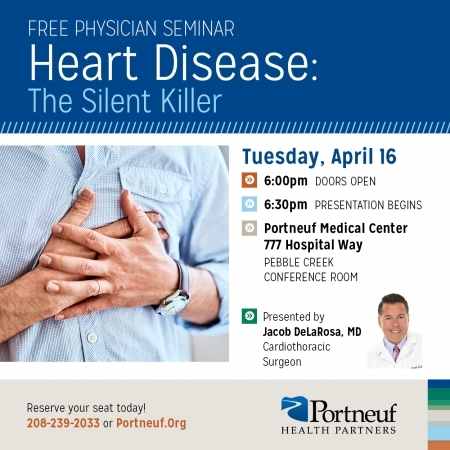 We will talk about risk factors for heart attacks, treatment of heart disease, surgical innovation and heart care at Portneuf. The seminar will be held in Portneuf’s Pebble Creek Conference Room. Doors open at 6pm; the presentation begins at 6:30. Light refreshments will be served. To reserve a seat, visit portneuf.org/event/community-seminars or call 208-239-2033. To learn more about upcoming seminars and events, be sure to like Portneuf Medical Center on Facebook. Our heart and vascular team has a heart game plan for you. We offer comprehensive cardiac care and vascular services that include beating heart surgery, coronary intervention, cardiac rehabilitation, endovenous laser treatment, transcatheter aortic valve replacement (TAVR) and a full range of diagnostic and therapeutic services. With our extensive expertise, we can offer a good prognosis for most patients, even those who might have been told that their options were limited. To reach our cardiology team, often the first play in your treatment plan, call 208-239-3899. Dr. DeLaRosa is the chief of Cardiac and Endovascular Surgery and double board certified in cardiothoracic surgery, and general surgery.